Coolest gadget on the planet right now and it’s EXPLODING. Here is a case of reality being decidedly less click baity than fiction. 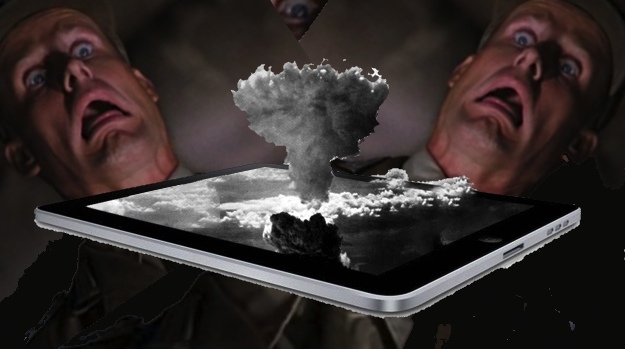 Global headlines proclaiming the exploding iPad Air in Australia turn out to be false. “It was an earlier generation iPad with Retina display model — not one of the more recently launched devices. Apple is investigating the cause,” said a Vodafone Australia spokesperson. Reports last week that an iPad Air exploded inside a Vodafone store and that the fire bridge was called in to douse the “blaze” turn out to be only about 10 percent true. No, it wasn’t Apple’s newest, coolest, OM-effing-G tablet in the history of history. And, while the firetrucks did respond, that was likely due to Vodafone store associates not knowing what to do when the water hit the floor rather than any serious threat.